We achieved 10th last year (2017), so we’ve slipped 6 places, but OMG are we happy with being 16th in the whole country? well the answer to that is a big YES! – and thanks again for all the lovely people that make it happen by writing us a 5 star review. 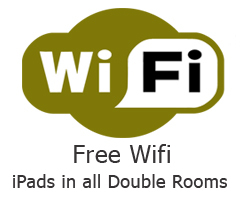 Tripadvisor visited us at The Twenty One, Brighton and made a short video of us and our B&B!! – check it out on YouTube – how nervous is Andy!!!! Congratulations, your establishment has been awarded the AA Gold Star Award for 2016. This award reflects your establishment’s positioning within your star band based on your score from your last AA visit, compared to the scores of other establishments, at the time of our guide going to print. From large luxury hotels to snug country inns, the Top Hotels are our best hotels in the country. They are selected from each of the star-rating levels for their exceptional quality of accommodation and customer service. 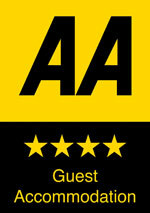 AA inspectors determine a quality score as a percentage to cover all aspects of a guest accommodation, including service. The score is then represented as a Star rating. Gold Stars indicate that the establishment is within the upper 10% of the quality score range nationally for that star rating. 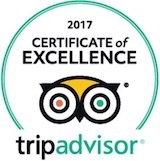 We are so pleased to have achieved a Certificate of Excellence from Tripadvisor for 2017. Number One in the World B&B! We were so happy to have been awarded the Travellers’ Choice award in 2012. The Twenty One is the only B&B in Brighton to have ever been awarded a Travellers’ Choice award – We were voted as the best B&B in the World! – can you believe it!! – we can’t – we were so happy! Please see our feature in The Daily Mail back in 2012 regarding our fantastic win!